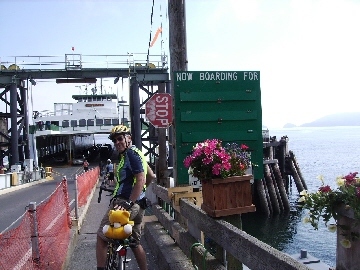 We had time to ride into Sidney, sightsee, and grocery shop before catching the 11:20 AM ferry to Anacortes. 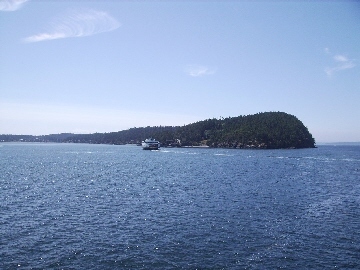 For some reason the ferry to Anacortes sails right through the San Juan Islands without stopping. 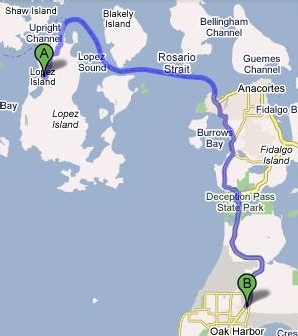 The bad news is that we had to pay for the longer sailing to Anacortees and the shorter one back to Lopez. 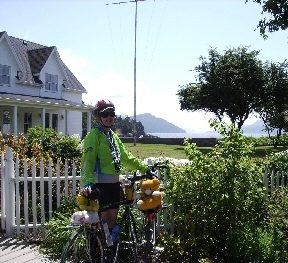 The good news is that once in the San Juans, pedestrians and bicycles rode free to any of the island and back to Anacortees. Moma bear waiting in Anacortes for the ferry to Lopez Island. Saliling back to Lopez Island. Farm on Lopez, the only one of the San Juans that is even slightly flat. The next morning we were off to Orcas Isalnd by ferry. 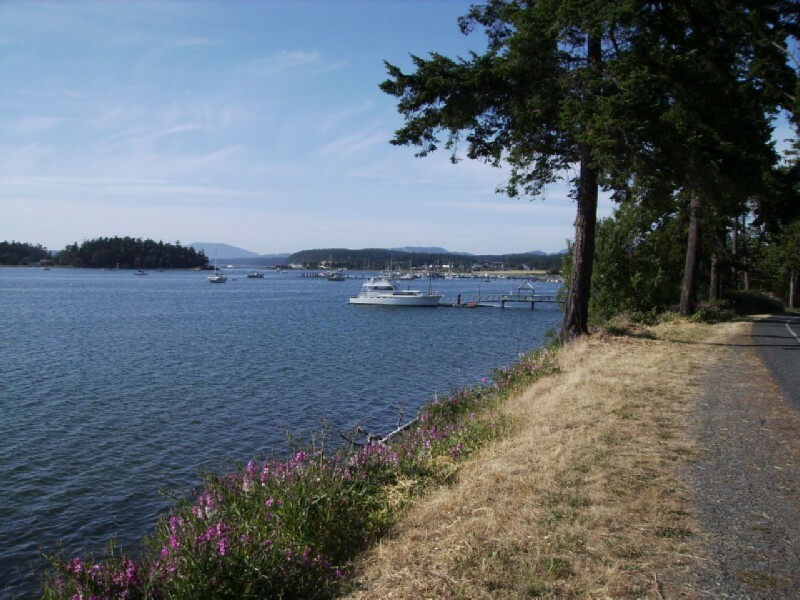 Our desination was the village of Eastsound on the northern side of the island, 10 hilly miles from the ferry landing. 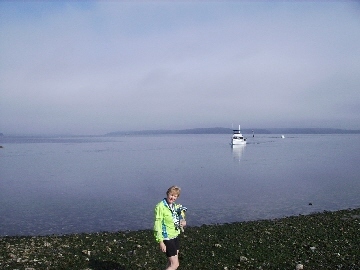 The next morning we were off to Friday Harbor on San Juan Isalnd by ferry. 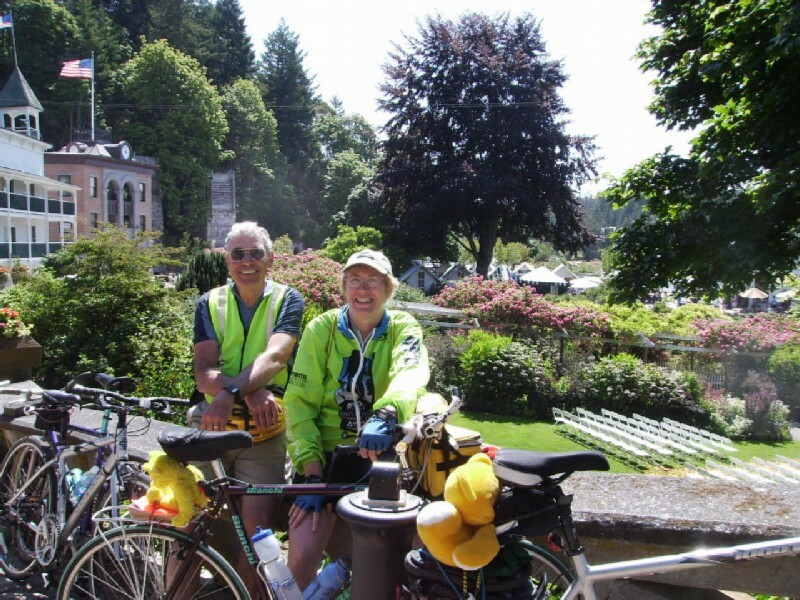 After riding around Friday Harbor, our desination was Roche Harbor on the western side of the island, 10 miles from the ferry landing. 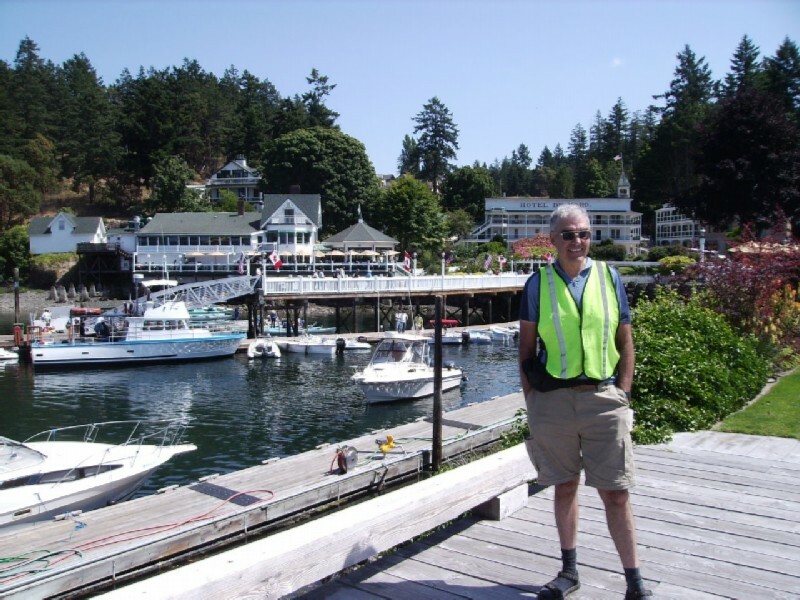 Roche Harbor began in the 1880's as a lime stone quarry and processing plant. A hotel, employee housing, company store, and docks have been turned into an up-scale resort, taking advantage of the very scenic location. 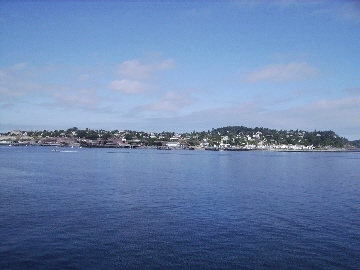 Roche Harbor. We had lunch at the cafe, a fancy serv-yourself restaurant, on the waterfront. 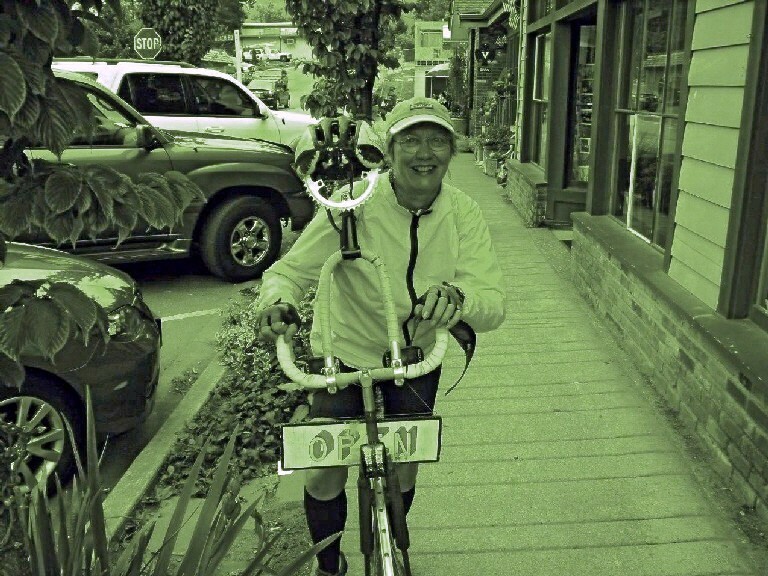 This was the only time we ate out, other than the biker cafe in Poulsbo. Mama bear and papa bear resting before returning from Roche Harbor to the ferry at Friday Harbor. 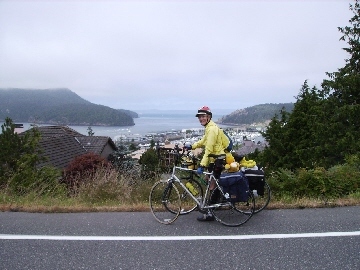 Overlooking Anacortes on the coast road to Deception Pass and Whidbey Island. This was the hilliest part of the whole trip. 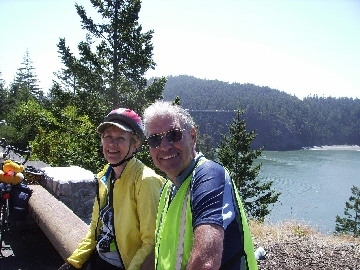 Just when I had about enough, we came upon Deception Pass making it all worthwhile. 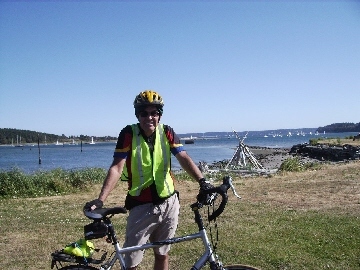 Papa bear resting before pushing the bike on the narrow sidewalk on the Deception Pass bridge. 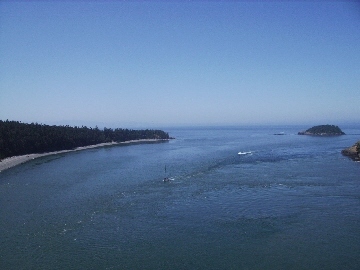 The Hildalgo Island (north) side of Deception Pass viewed from the bridge. 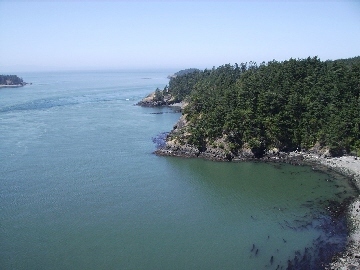 The Whidbey Island (south) side of Deception Pass viewed from the bridge. Fleet coming into Oak Harbor. There was a sail boat regata going on. It turned out to be a good choice. 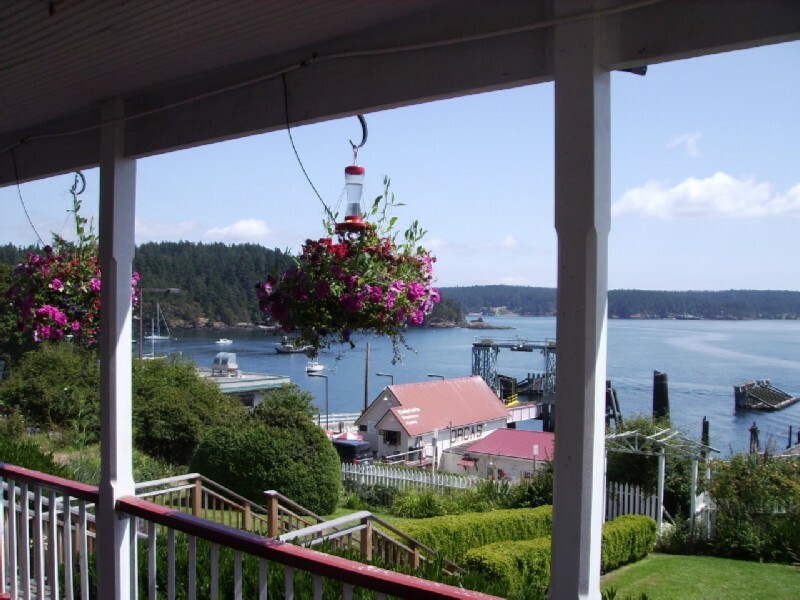 In fact, if I had noticed on the internet the elegant, but reasonably priced Palace Hotel in Port Townsend, I would have stayed here and only one night in Oak Harbor. 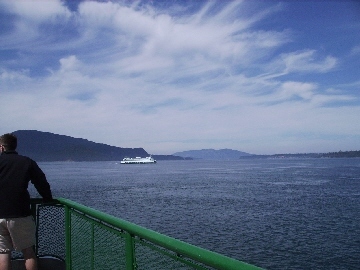 The biggest bargain of the trip was the extensive and free bus system on Whidbey Island. 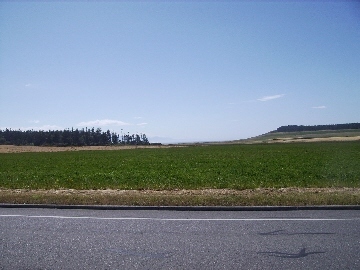 Ebey's Landing National Historical Reserve - between Coupeville and Keystone - Port Townsend ferry. 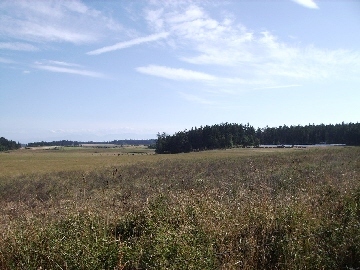 Apparently, this large farm receives a tax break in exchange for not turning it into urban sprawl. 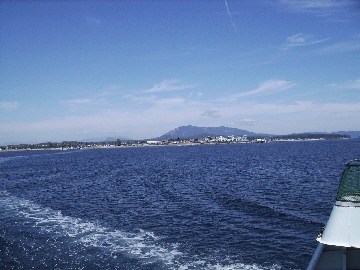 Approaching Port Townsend on the Keystone(Whidbey islan) - Port Townsend ferry. 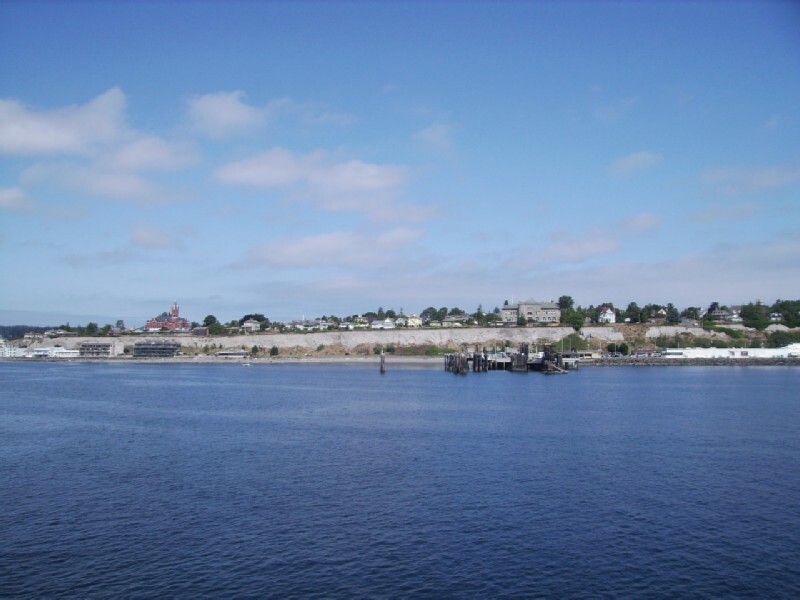 Gettting closer to Port Townsend. The large buildings are actually on a plateau up a steep hill. 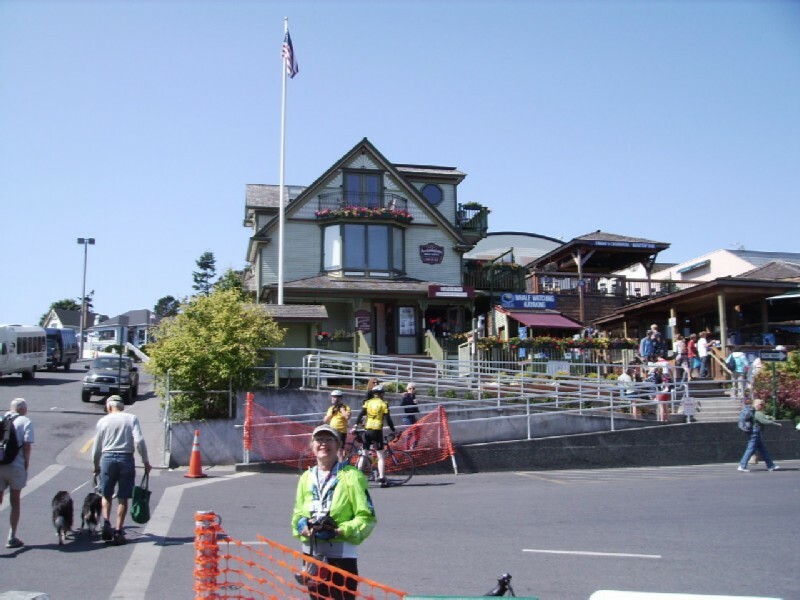 The old part of town consists of the first two blocks near sea level. 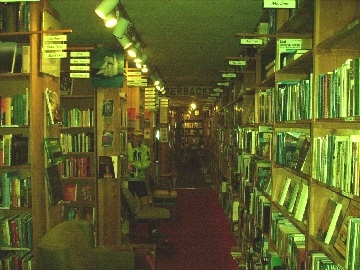 Bookstore in the old part of Port Townsend. 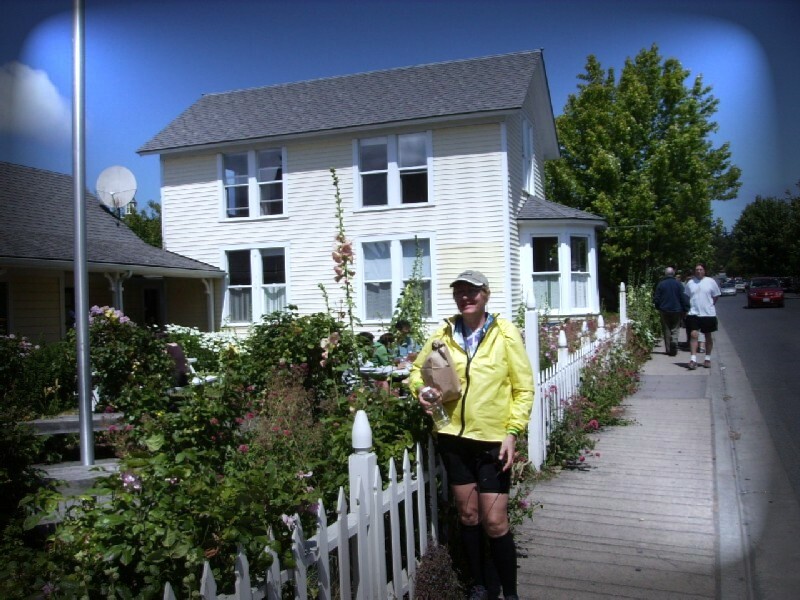 I found Port Townsend to be more interesting than most "botiqued" downtowns. 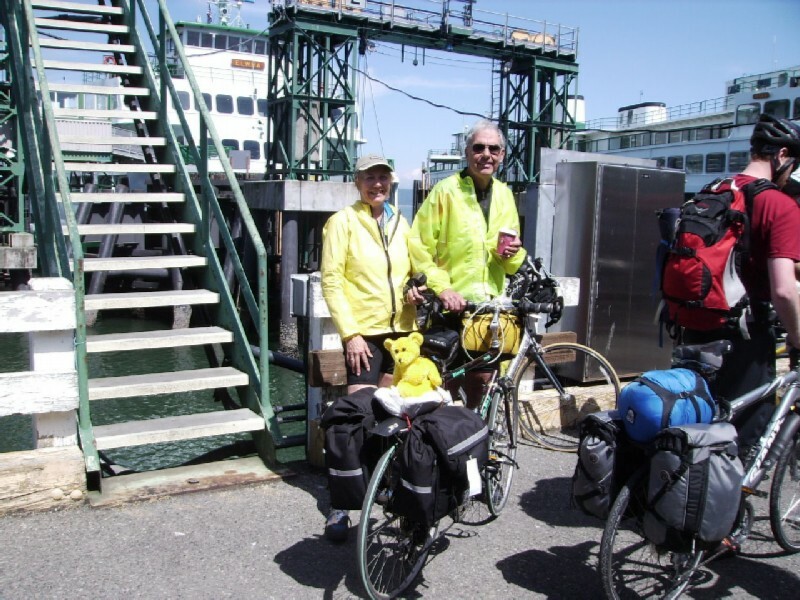 The destination of our last bicycling day, the Travelodge in downtown Everett, was 46 miles away, more than our daily ration. So we again made use of the free Whidbey Island Transit System. 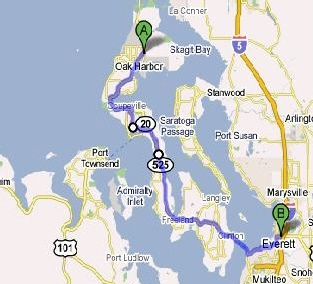 Route: bus to Coupeville, back roads to WA 525, Clinton - Mulkiteo ferry, Mukilteo Blvd, side streets to motel. Jeanine hated WA 525. I had mixed feelings. The wide shoulder made it safe enough; but the noise from constant traffic made it more work than fun. 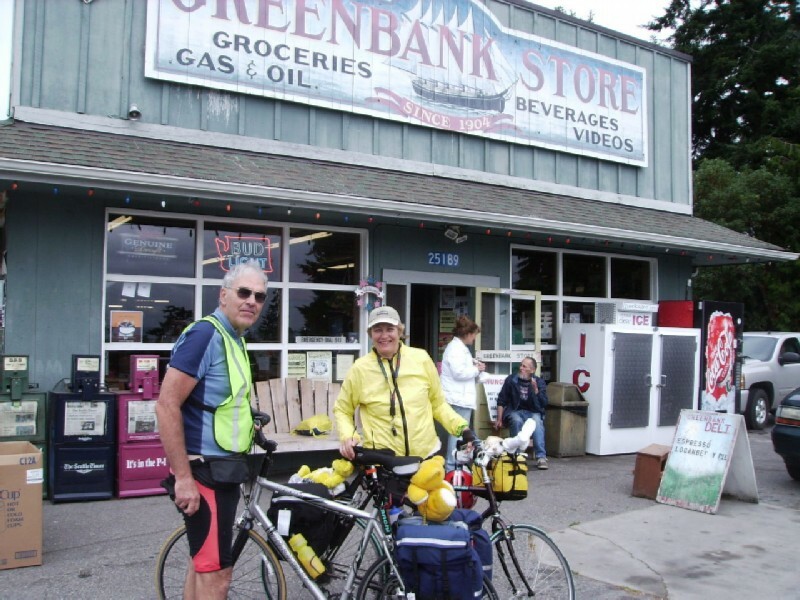 Greenbank general store in the small village of the same name on central Whidbey Island. 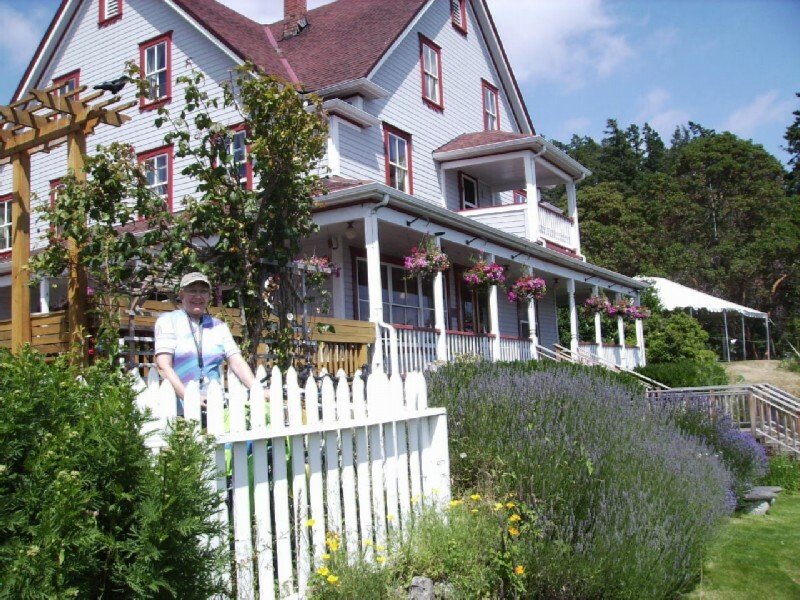 This, along with The Diner in Poulsbo and the Valley View Motel in Discovery Bay, were the only down-to-earth establishments we saw the whole trip. Coffee was $0.50 and $0.75. 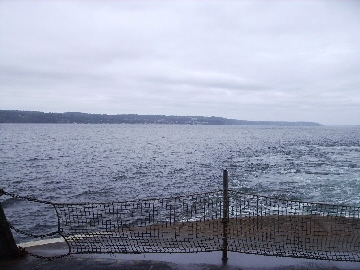 Last look at the islands from the Clinton (Whidbey Island) - Mukilteo ferry.